Our team conceived the idea of creating a Forex spread rebate service back in 2006. At that time, the website was running on a free host and worked just for a small group of traders (about 20). While we were gaining some experience and focusing on different nuances and details, we were stunned by the results we were able to get. Some of the traders working with us managed to earn up to 80% of their deposit! So we worked till late 2008, when our team decided to make our project public and accessible for all. In 2009, we managed to launch the FxOtkat project which immediately drew the attention of a huge number of investors and traders. Just a couple of months later, FxOtkat changed its domain to become FxCash, up to now. This is when our new history begins. At FxCash, we see our mission in continuous improvement of the quality of service, as well as adding new, useful and profitable tools for traders. Our ultimate goal is to create an elite Forex traders' community. Nowadays, we are a well-established market leader providing our clients with unique advantages, such as instant spread rebate, comprehensive support services and the maximum profit possible. Our team is comprised of best experts in the industry who are always happy to explain each and every detail of how the Forex market works. By choosing us, you are sure to achieve marvelous results and succeed in Forex! Get started today! 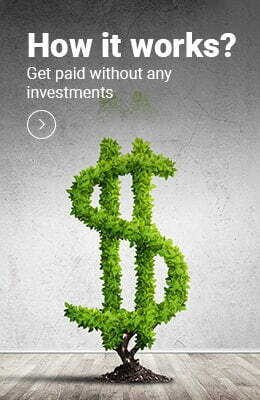 Get instant forex rebates on your FxCash account very simply and quickly. Join now now and appreciate the benefits of our service!